Dermaplaning involves the use of a straight edge razor to shave off unwanted hair and slough away dead epidermis. The cost of at-home dermaplaning can be as little as $5 for eyebrow razors, or as much as $189 for the Dermaflash, a home exfoliation device. Professional spa dermaplaning treatments cost between $75 and $250. If you follow skin care trends and love integrating new techniques into your beauty regimen, you’ve most probably heard of dermaplaning. This increasingly popular exfoliation treatment gently scrapes peach fuzz and dead skin cells away from your face. It’s a painless procedure that produces amazing results — when done using the proper tools and techniques. Here we examine the pros and cons of dermaplaning, with some advice from the experts. Esthetician Lindsey Fredell from George the Salon in Chicago explains why in her opinion, it’s best to have your dermaplaning done by a pro. “Don’t get me wrong, you will get results by doing this yourself,” she says. “It’s just that professionals are able to remove more layers of skin, giving you faster, better results.” She also points out that at-home treatments generally fail to provide exfoliating benefits, especially when performed with a simple razor. At George the Salon, Fredell offers clients a “Time Lapse Facial” ($250), which includes dermaplaning, a peel, and light therapy in one 90 minute visit. According to Fredell this is the ultimate option for people who expect more from their dermaplaning than what can be achieved at home. “A deeper dermaplaning treatment stimulates the skin by amping up the cells, boosting collagen production and promoting elasticity,” Fredell says. Genevieve Vielbig, who performs various skin rejuvenation treatments at Erase Medspa in New York City, also recommends professional treatment packages. In some cases she will combine dermaplaning with chemical peels for even more intense results. “Dermaplaning preps the skin by exfoliating, making mild chemical peels more efficacious,” Vielbig explains. Some Youtube beauty gurus and dermaplaning experts swear that outstanding results can be achieved at home, using the simplest of tools. However, DIY dermaplaning may also leave you with really dry skin or “simply feeling like you just shaved,” notes Fredell. And while a 3-pack of eyebrow razors from Sally Beauty that costs $5 may do the trick, a word of caution is in order: improper handling of the blade is likely to cause irritation and cuts. Foundation makeup applies more smoothly. The skin absorbs sunscreens and moisturizers more easily. With time, you may notice minor improvements in your skin’s tone and texture. You can say goodbye to facial peach fuzz. Most at-home dermaplaning enthusiasts will warn you to be especially careful around your eyebrow lines, and to avoid doing your nose. Different angles and degrees of pressure can be applied where age spots and fine lines are more of a concern. Any red welts or minor cuts from the razor strokes can be treated by applying aloe vera moisturizer to your entire face afterwards. And while some experts may recommend using moisturizers immediately after, others suggest to let the skin cells heal before resuming your daily skin care regimen. Fredell suggests Vitamin C to brighten and Vitamin A to help with cell regeneration. And since skin layers are being removed, sunscreen is imperative. At-home dermaplaning tools vary widely in price, but they all work following the same basic principle: steel blades are used to gently shave and exfoliate the top layer of the skin. Here are some of the top dermaplaning tools available on the market today. 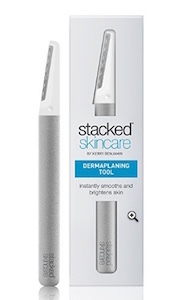 Staked Skincare’s dermaplaning tool removes dead skin cells on the surface of the skin and peach fuzz with incredible ease. This at-home tool gently exfoliates the face and neck to reveal a youthful and glowing complexion. It comes with a patented maximum blade surface to protect your skin from injury, and a comfortable handle with perfect balancing weight for optimum blade control. The blades are safe and easy to replace when they get dull, but because of the blade guard you will not get as deep of a treatment as you would with other dermaplaning tools on the market. 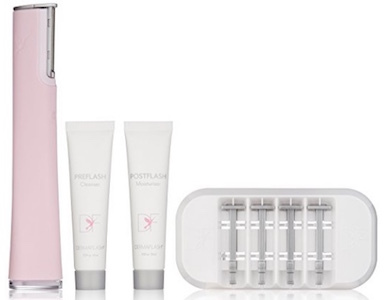 The Dermaflash was created by women, and is marketed specifically to women as the best tool to eliminate peach fuzz, dead skin cells and product build-up from the surface of the face. It offers multiple settings for added convenience, an LED battery indicator light to let you know when it’s time for a charge, and a USB charging cradle that’s bound to save you tons of money on batteries. The silicone storage sleeve offers waterproof protection as you travel and shower. You do need to replace the blade after each use, however, and the safety cage does have a tendency to erode after a while. This exfoliating facial razor and eyebrow shaper pack is perfect for on-the-go grooming. The tools’ slim and portable size make them perfect for throwing in a purse, clutch or gym bag. The blades feature micro guards to help protect your skin as you exfoliate and shape your brows. The convenience, design, price and portability of Schick Silk makes it a great choice for quick touch-ups, but the blades are more dull than other brands; you risk cutting yourself if you’re not careful. 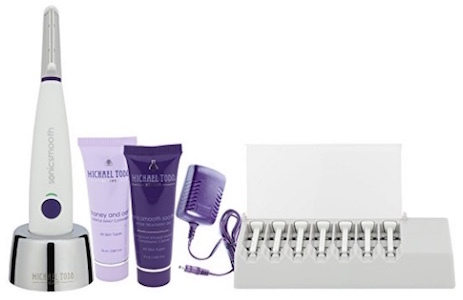 This at-home dermaplaning kit is unique in that is combines sonic power with multiple gentle blades for a precise dermaplaning treatment that is highly effective. It offers multiple speed settings for a customized experience, and promises to improve rough skin texture, enlarged pores, fine lines and dullness. Your creams and serums will become more effective and makeup will appear more flawless on your face with continued use. While it does a great job of improving the skin’s overall texture and tone, the Sonicsmooth sometimes misses hairs and won’t remove all your peach fuzz unless the treatment is repeated several times. » If you’re considering at-home dermaplaning or researching different exfoliation treatments, ask a cosmetic doctor for advice and schedule an appointment using Zwivel’s free online consultation tool.